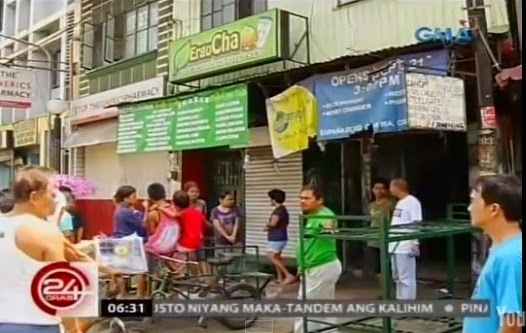 MANILA, Philippines - Two people died and another was hospitalized after drinking milk tea at a shop in Sampaloc, Manila on Thursday, April 9, 2015. A CCTV video of the incident was shared to the authority and press to analyze the cause of the alleged poisoning. Reports said that Suzanne Dagohoy, 28, and her boyfriend Arnold Aydalla, 34, bought the Hokkaido-flavored milk tea at ErgoCha Milktea House in Bustillos Street, Sampaloc around 11:00 in the morning on Thursday. Aydalla took a sip of the milk tea and immediately spitted it out after he found out the taste is different. Dagohoy did the same thing after her boyfriend handed it over to her. Aydalla complained to the owner of the ErgoCha store due to its strange taste. Store owner William Abrigo, 57, has denied the unusual taste and even tasted the milk tea to prove that there was nothing wrong. According to witnesses, it was Dagohoy who collapsed first then Aydalla experienced the same. Abrigo also succumbed after few minutes. All three were rushed to a nearby hospital by the pedicab and tricycle drivers. Abrigo and Dagohoy were declared dead on arrival. Dagohoy passed away at 3 p.m., while Abrigo died around 5 p.m. Aydalla is still being treated at Ospital ng Sampaloc. In a report of GMA News, it said that witnesses saw a member of the shop's staff named Joseph Garnacio throwing milk tea in the sewer. Tapioca pearls were found in the area. Garnacio said to media they had started receiving complaints about their milk tea after a son of Abrigo brought in a chemical, but added he did not know what it was, prompting probers to suspect the milk tea might have been contaminated. Currently, the Food and Drug Administration (BFAD) is studying the sample of the milk tea. Remains of the victims are now undergoing autopsy at the PNP Crime Laboratory. Meanwhile, Dr. Benjamin Yson, the head of the city health department of Manila said the incident was “too fast, too quick and too fatal” that the victims weren’t able to leave the premises of the tea shop. “But until we have the results of the specimens sent to the BFAD (Bureau of Food and Drugs), we can’t really say what happened,” Yson said. Since Abrigo also died in the incident, families of Dagohoy and Aydalla may file chrages of reckless imprudence resulting in homicide and physical injury to Adela, wife of Abrigo and the registered owner of the shop.